"Think of shirts as blank canvases and the various textures, colours and patterns of jackets and accessories as paint strokes." On the topic of building a sartorial wardrobe of business classics, it is not uncommon that one might potentially focus all his attention on either suitings or shoes. 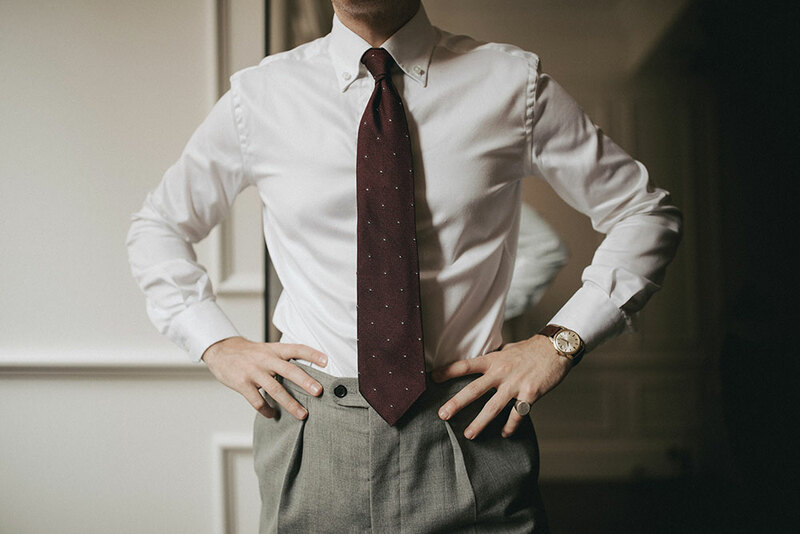 And often underlooked is the significance of shirtings and how they might potentially play a strong supporting role in making or breaking an outfit. Metaphorically speaking, think of shirts as blank canvases and the various textures, colours and patterns of jackets and accessories as paint strokes – ultimately, putting together ensembles that can be likened to great works of art. Here are five essential shirts that serve as the foundation of which our team of fitters have built looks around to create quality business ensembles. 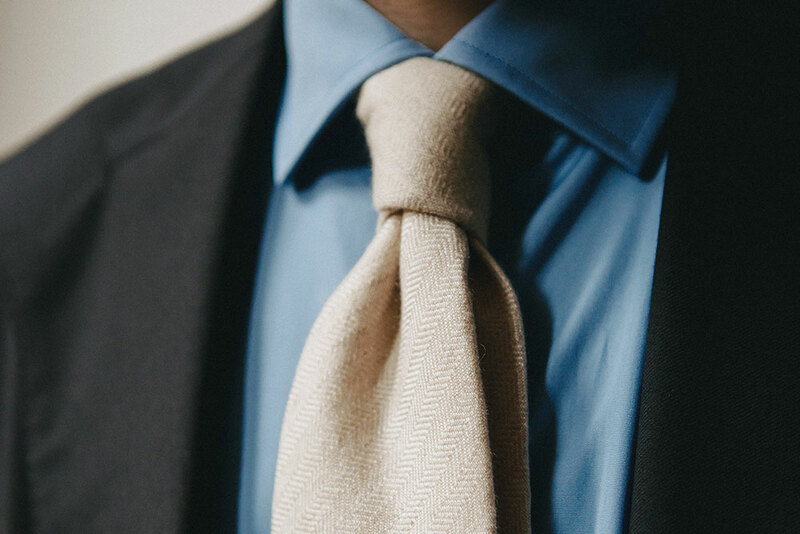 Straightforward and simple in its own right, a crisp white shirt is your go-to when the classic patterns of a suit and the fascinating textures of a necktie are the main appeal of an outfit. Neutral palettes are good starting points that open a world of suiting possibilities – from pinstripes and windowpane checks to glen plaid and houndstooth. 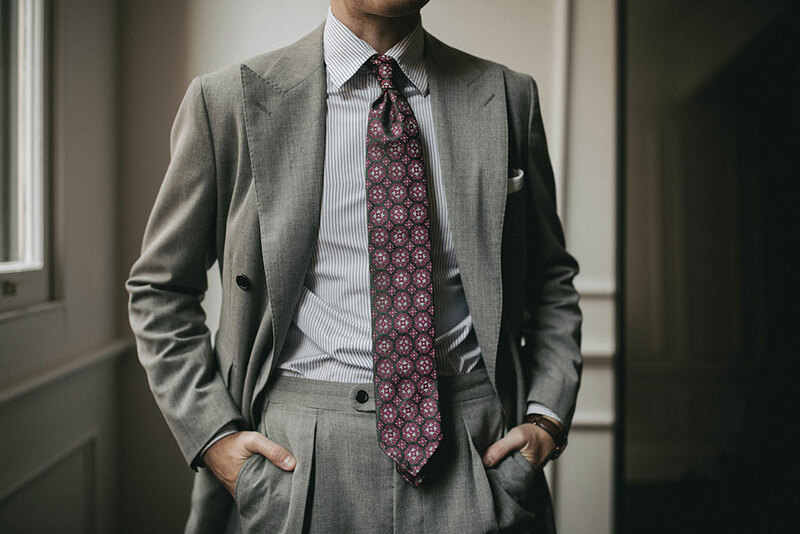 That, or opt for a well-tailored navy or grey suit alongside a statement necktie such as a rich textural grenadine with light spots (pictured), or a beautiful silk number with bold regimental stripes. Almost as versatile as white, a shirt in cornflower blue complements two- or three-piece business suits of midnight blue, black and charcoal grey. It goes well with fabrics in earthier tones too – including taupe, sand and olive green, all benefiting from the coolness of cornflower blue. Add the intriguing slubbiness of a shantung tie, or a solid cashmere example as pictured to create the finishing touch of the outfit. Bengal striped shirts – featuring alternating stripes of white and colour – can be commonly observed in both a business and casual context depending on its fabric. 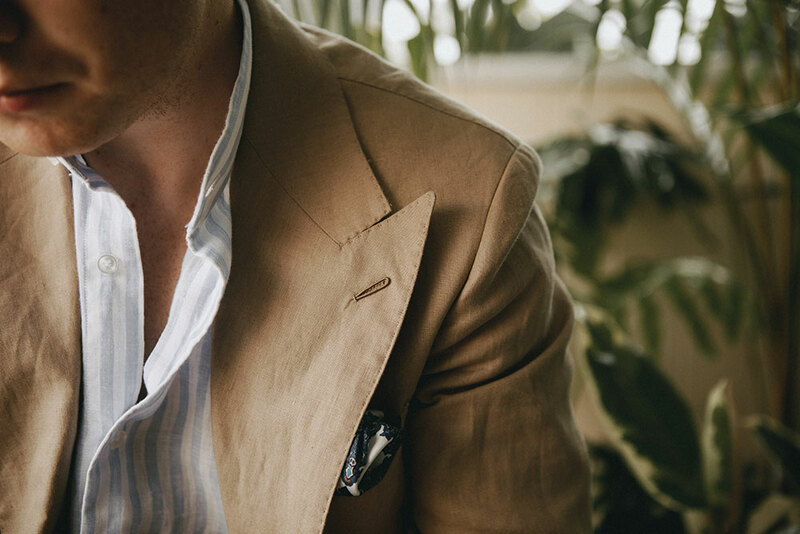 Perhaps in linen, bengal stripes can form an arresting look and styled in accordance with casual Friday outfits and after-work drinks in mind – the broad stripes shown here team well with less-structured cotton suits or the evergreen sports jacket and chino trousers combination too. Stripes are a rather powerful statement but also a conservative addition to incorporate into your business outfits. Opting for a shirt with narrow stripes also help elongate the height – ideal for men of smaller stature. The key is the contrast between dark and light colour palettes – what this means is essentially pairing suits with dark solid colours against shirts with lighter coloured stripes. This also leaves plenty of creative space to throw in a necktie into the mix – consider geometric patterns on a classic silk jacquard (pictured). Denim is more commonly associated with jeans but the weight of various fabrics make for different garments. In this case, the denim is lightweight and breathable enough to be tailored into shirts that pair well with other sartorial garments. In addition, it is washed to also create a ‘fade’ that is somewhat similar to its light blue business-appropriate poplin counterpart but belonging to a more casual context. This ‘fade’ will continue to lighten after each wash – over time, what this means is a garment aged with the most characterful patina. Book an appointment with our Melbourne and Sydney showroom fitters to build a foundation of business, smart-casual and even weekend shirts according to your ideal fit or discuss other bits of stylistic advice today.